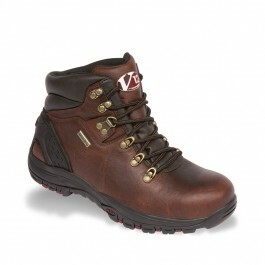 V12 Storm Brown Waterproof Hiker - A Safety Boot for all Seasons! The Storm safety boot oozes quality. Incorporating the benefits of top grade walking boots into highly functional safety footwear, and now comes with a composite toecap and ankle support. Now to full S3 standard with anti-static qualities. 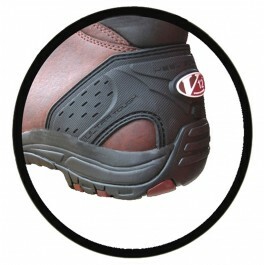 New highly slip resistant Flexlite Phylon/Rubber sole - provides excellent grip. Brass speed lace system for easy access. Wide fitting composite toecap. Resistant to 200 joules of impact. Deep padded scoop collar and ankle support. Full bellows tongue - Like a true walking boot - Prevents ingress of dirt and water. Full length, removable shock absorbing footbed, with arch support. Heat resistant sole to 200°c. The technical Symapex High2Out membrane ensures a comfortable dry element inside the boot all year round. Shock absorbing heel with defined heel breast. EN 1SO 20345:2004 S3 SRC HRO.